The lights were lowered in Hendricks Hall last Thursday and Friday, and a bevy of films flickered on the big screen: features, short films, mini features, documentaries, and animated films, all with a social justice theme. 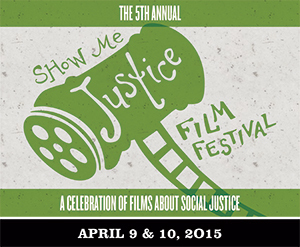 It was the fifth annual Show Me Justice Film Festival, and the University of Central Missouri was buzzing with filmmakers, students, faculty and community members viewing the films. Jasmine Grayson, a senior broadcast media major at UCM, said she is intrigued with the festival, but isn’t sure why. Grayson attributed her repeated attendance at the festival to a love of film. “I really love the films,” Grayson said. “It (interest in the festival) really has nothing to do with the social justice aspect.” Grayson commented that she liked “Inside Story,” a 27-minute feature shown on Friday night. Grayson said she was “iffy” on the movie when it first started. She was concerned that the women in the movie might be exploited for the sake of the film, but Grayson said as the movie unfolded a heartfelt story was told. “Inside Story” is a mini-documentary about a theatre actress fulfilling the role of outreach worker, connecting with female prisoners in Memphis, helping them to talk and write about their experiences, then having actresses on the outside perform the written works. Tales of trauma, abuse, addiction, prostitution and witnessing suicide are accounted and re-told, eventually being performed at a showing for the inmates. “Inside Story” was followed by the documentary “Conviction.” The film documents the tale of Catholic nuns engaged in civil disobedience, the minor vandalizing of a Colorado nuclear weapons storage facility. They were charged with sabotage and sentenced to prison. The film delved into their motivations, the action that led to their incarceration and their trial. The director and producer of “Conviction” and two of the nuns were all guests at the festival. After the showing of the movie, both Sister Mary Ardeth Platte and Sister Carol Gilbert made their way down the isle of Hendricks Hall, greeted by a wave of applause as they took to the stage. Director Brenda Truelson Fox and producer Robin Truesdale shifted the focus to the two sisters and encouraged the audience to direct questions at the two activists. During the Q&A session, Platte said she has no regrets about any of her peace movement protest activities. She said she had pursued more conventional protest methods before resorting to civil disobedience. “Young people have the capacity and potential to build the world as God intended,” Plattte said. “Jessica Walking,” a film relating to a dilemma many young people, particularly young women, face was screened the previous night. The narrative film deals with sexual assault in an ambiguous manner. A young woman named Jessica drunkenly stumbles into another woman’s home, and the woman, in her late 30s, temporarily acts as Jessica’s confidant and caretaker while Jessica tries to piece together what happened the night before including a sexual encounter she can’t fully recall. The ambiguity of “Jessica Walking” is that the encounter is never shown, only alluded to through fuzzy flashbacks of the night’s events before the encounter. The film’s director Maria Sanders was on hand to explain more. Sanders teaches at Central Washington University and said her observation of the drinking/party culture was another inspiration behind making the film. The content of some of the fest’s films also extended to international issues. “A Dress Rehearsal for an Execution” was one example. The director Bahman Tavoosi resides in Montreal, Canada and is of Iranian descent. His film was a feature narrative about an artist recreating a Pulitzer Prize winning photo of an execution taken during the Iranian revolution of 1979. Mark von Schlemmer, festival director and UCM professor in the department of communication, said that the film could be challenging to the audience, not because of content, but in how the movie breaks away from a typical narrative. Another film from the festival with an international theme, pertaining to a recent revolution, was the 15 minute documentary, “Not Anymore: A Story of Revolution.” The film follows a 24 year old photo-journalist documenting war-ravaged Syria. She weeps and mourns for the loss of dead friends, yet she states she is not afraid to die. The film was shown Thursday afternoon, as part of a series of shorts. Before the showing of the collection, Von Schlemmer told the audience that some of the images within the films might be challenging for some viewers. “Not Anymore: A Story of Revolution.” won an audience award at the festival. Regarding the future of the Show Me Justice Film Festival, Von Schlemmer would like to see increased promotion of the event, thus bringing more attendees. “Going to a film festival is one step beyond the movie (theater) experience,” Von Schlemmer said.